Lakeshore Records has released Snitch, the Original Motion Picture Soundtrack digitally on Tuesday, February 19, 2013 and on CD March 5, 2013. Antonio Pinto (Get The Gringo, City of Men) composed the original score. Antonio Pinto received a Golden Globe® nomination in 2008 for Best Original Song “Despedida” co-written with Shakira from the film Love in the Time of Cholera directed by Mike Newell. Most recently Antonio scored The Odyssey, commissioned especially for the 2012 Cultural Olympiad, and Senna, a critically acclaimed documentary based on the life and career of Formula 1 driver Ayrton Senna. Senna was the winner of the 2010 Sundance Audience Choice Award and 2011 BAFTA winner. Antonio is currently scoring Witness an HBO series executive produced by Michael Mann. Previously Antonio was celebrated for his brilliant score to the indie smash City of God. Antonio Pinto has been scoring films for nearly a decade including many award winning pictures including Perfect Stranger Lord of War, The Vintner’s Luck, Collateral, Central Station, Behind the Sun, and Midnight. He has collaborated with such directors as Asif Kapadia, Michael Mann, Mike Newell, Andrew Niccol, Niki Caro, Fernando Meirelles, Walter Salles, Sérgio Machado, Heitor Dhalia, as well as up-and-coming Ecuadorian director Sebastián Cordero in Cronicas starring John Leguizamo and produced by Alfonso Cuarón and Jorge Vergara. 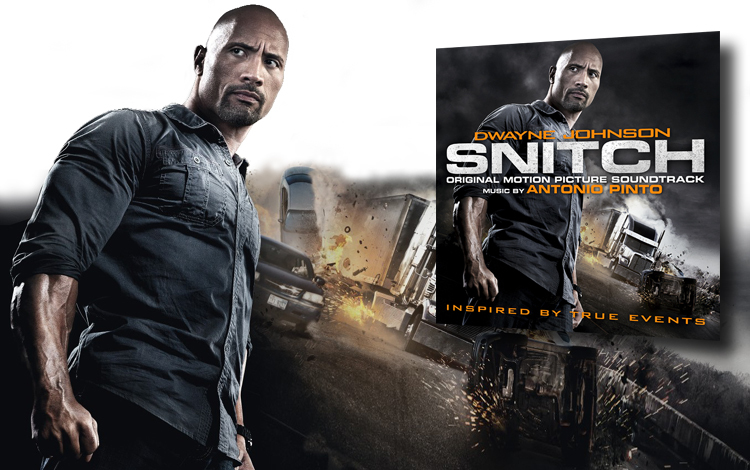 In the fast-paced action thriller Snitch, Dwayne Johnson stars as a father whose teenage son is caught in possession of a package that, unbeknownst to him, contains enough narcotics to warrant a mandatory minimum prison sentence of 10 years. Desperate and determined to rescue his son at all costs, he makes a deal with the U.S. Attorney to work as an undercover informant and infiltrate a drug cartel on a dangerous mission – risking everything, including his family and his own life. The film is directed by Ric Roman Waugh from a script written by Justin Haythe and Ric Roman Waugh. The score is available for download on Amazon.com, Amazon UK, Amazon France and Amazon Germany.